The mission of Save Our Juries is to uphold the jury system and the right provided by the 7th Amendment by educating the American public about the history and the value of the civil jury trial. 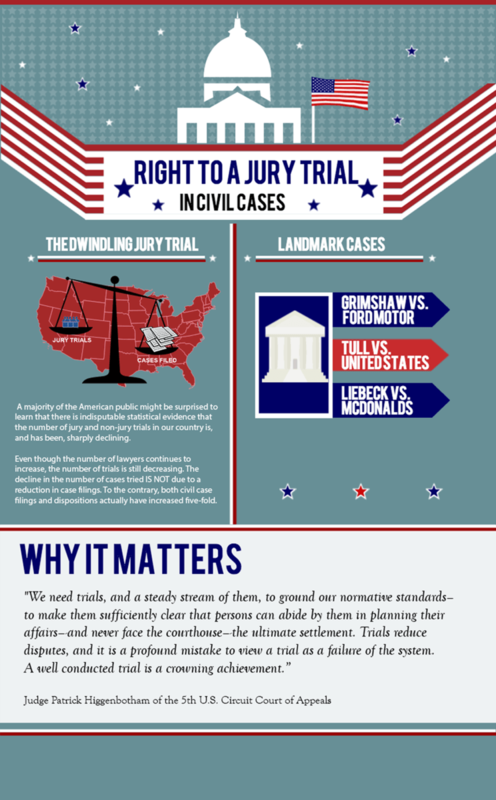 Our launch is in conjunction with the 4th of July, symbolizing the recognition by the founders of our country that the right to a jury trial is a liberty which they would no longer be denied. Jury trials allow citizens a forum for grievances to be heard by their peers in order to produce a fair outcome, and why the justice system is for everyone, not just for those who have the means to pay for it. We will have weekly updates highlighting relavant news and current trends. We look forward to your feedback and support. This entry was posted in Uncategorized and tagged American public, civil jury trial, jury system, jury trial, Save Our Juries on July 3, 2014 by jagd. Notice that with a “Trendy” jury you need one out of nine people in the general population believing in Theory I, or knowing what things are really like in the hood, or whatever, before you have any better than a coin-flip chance there is anyone to talk about that in deliberations. Then when you realize “unbiased selection” does not mean the same thing in a courtroom that it does in a math exercise, you really get a feeling for the chances of an innocent defendant being convicted by a short jury. The great virtue of juries is that they don’t respond as a mathematical exercise. Jurors have a shared decision making responsibility and are free to make difficult decisions without repercussions. Almost universally jurors take their job very seriously and follow the law and the instructions from the Court. It is an example of citizen synergy which most often reaches the correct and just result. This is the very rationale of the 7th Amendment; otherwise, if we do not trust juries to make decisions, then those decisions will fall to a single judge whose judgment would be subject to potential social and political repercussions. We do not have random selection of juries. The concept of innocent till proven guilty is always addressed in voir dire. Potential jurors who do not affirmatively agree to act on this principle will be stricken. Beyond that, the point is driven home in the court’s instructions both at the outset of the trial and just before jury deliberations. The best safeguard on this score is attorney directed voir dire where potential jurors can be thoroughly scrutinized as to the sincerity and depth of their beliefs. Thank you to ABOTA and Mark Robinson for launching Save Our Juries! I want to address corporate America and its fear of juries. Juries are not anti-business. The studies prove it, and my experience proves it. I was taught as a young defense lawyer to demand a jury in every case. That has remained my policy for 31 years and, though I have lost cases, I have never regretted trying the case to a jury. Juries are just better and fairer fact finders than judges or arbitrators. Try it, corporate America, you’ll like it. I represent corporate America and am also a proud member of ABOTA. Routinely, I counsel those same corporate clients to embrace the jury system. The collective conscience of the jury is a basic tenet of American jurisprudence and all citizens are better off with the system than without it. Let me be plain: Juries are not anti-business any more than judges are pro-business. Horray for the 7th Amendment! Thank you ABOTA. Save Our juries is a fantastic new resource and fabulous start to rebuilding broad public support and appreciation for the Constitutional promise that The People are empowered and entrusted with determining standards of reasonable conduct and measures of damages. This is very basic tenet and “check” in our democratic Republic keeps the law grounded with community standards. I too, represent a corporate client and counsel it, other businesses and chambers of commerce of that juries most often get it right and we are far better off with their collective judgment than with an arbitrator or single judge. I wholeheartedly agree with Rick and Don above. Civil juries “get it right” more often than not. I have been asked by many business persons and groups: “What can we do to improve the jury system?” My advice is always do not seek to be excused when you are summonsed to serve as a juror and don’t try to get your employees excused. While I agree that preserving the jury system is very good for society (and for many lawyers), I am concerned that we are devoting so much of our current efforts toward emphasizing what is good about the system, and too little time analyzing why it is that the jury system is loosing the broad support of the society it benefits. Preaching to the congregation won’t do much good if only believers are in the church. The jury system arose as part of the justice system when people did not trust the honesty or the fairness of those with the final right to make the rules, decide the facts, and resolve the disputes. Judges, the police, the government agents, wealthy businesses were felt to either be biased, corrupt, or incapable of understanding how the real world worked in the circumstance involved. Certain types of cases were felt to be more challenging to reaching a “fair” result, and these cases were assigned to be determined by juries. But while the jury system may have helped in the “fair” and “just” resolution of disputes, it did not improve either the goals of rapid resolution or inexpensive resolution of disputes. In addition, those with influence often didn’t agree with the juries decisions, and thus more “rules” were written by legislators, conceived by government entities, and created by judges to limit the options of juries in making decisions. The end result however of these ever changing circumstances and changed rules is that today actual trials are frequently not financially rewarding to the clients, and their outcomes remain in many cases very uncertain. It almost always makes more sense to the client (and some of the lawyers) to settle rather than face the risk and expense of a trial by jury (and the costs, delay and uncertainty of a possible appeal and re-trial). As a result, the jury system today too often remains as only a threat to the client about what might happen if they don’t find a way to settle the pending dispute. While selecting a jury to resolve the dispute may bring about a more “fair” and “just” result, everyone would agree that the result will only possibly be viewed as fair by one party, and only potentially “just” by the trial court and appellate court (s). I am in the congregation that believes that a jury will more often produce a result that society will consider “fair”. But we perhaps need to focus our attention, and perhaps our efforts, to devise ways in which we can convince society of the benefits of obtaining that fairness. There is a caution to be considered. One cannot ignore the “expense factor” of the current system. Part of that expense involves the use of lawyers, and that expense must be deemed necessary by clients or potential parties to a dispute. As litigation continues to be more expensive, there will be more efforts arise to reduce the risk, keep the fairness (to the extent possible), speed up the process, but at the same time further reduce the cost. Reducing the costs involving use of the jury system, including the cost of lawyers, will be a factor considered by society as a whole. Working on that equation may not make any of us feel better, but ignoring the problem won’t make it go away. We are in agreement with your observations that the civil justice system was conceived to provide a means of resolving disputes fairly and justly with minimum delay and at a reasonable cost for all concerned, and that the current system is increasingly expensive. We also agree with you that efforts should include educating the public as to the benefit of obtaining the fairness that the civil justice system is designed to provide. With respect to your statement that it almost always makes more sense to the client to settle rather than face the risk and expense of a trial by jury, we would point out that this is in fact a symptom of the problems we are attempting to address. In terms of the practical realities of the situation, yes, in many cases it makes more sense for the client to settle, but it certainly does not mean that a fair result has been obtained. This is particularly true when the settlement is more a product of factors such as courtroom shortages, excessive costs and unnecessary expenditures, than the facts of the dispute and the available evidence. As you have said, the jury system today too often remains as only a threat to the client about what might happen if they don’t find a way to settle the pending dispute. However, that threat rings increasingly hollow as the chance of going to trial continues to approach zero for the various reasons we have discussed. Parties on both sides are often forced to enter into unsatisfactory and unfair settlements because they must factor in the necessity of avoiding excessive costs or protracted delays—extrinsic factors which really should not be part of the justice equation. When this occurs, the system denies the parties the full benefit of the civil jury trial and the civil justice system itself, and what it was intended to accomplish. This is why we believe that speeding up and streamlining the process, as well as reducing the expense of trials, will help restore and preserve the civil jury trial as a viable and realistic option, so that litigants on both sides can have the opportunity to go to trial expeditiously and economically. The civil jury trial is the cornerstone of the civil justice system, and its continued viability is essential to resolving disputes fairly and justly with minimum delay and at a reasonable cost. We appreciate your comments. I agree completely with your last paragraph. The problem arises when specific suggestions are made. The resulting arguments about the impact of the proposed change on interested parties results either in rejection of the proposal, or a proposal suffering from the disease lawyers are famous for … fixing by “tinkering” with what already exists. The result too often makes little progress, or narrow short term progress, but always is accompanied by all sides claiming the compromise was good since nobody “lost” and some “came out all right.” I will be most interested in seeing what specific proposals are made for changes to preserve the jury system. Even “tinkering” by lawyers with our system won’t work unless the clients see a benefit of using the jury system to resolve disputes that is clearly better than the other optional methods of “moving on” rapidly and with little delay..
1. The civil trial by jury was commonplace throughout the colonies. It was not reserved for complicated cases. Colonists were every bit as distrustful of royally appointed judges as they were of the king. 2. The Founding Fathers viewed the right to trial by jury as at least as important as the right to vote. Through the Bill of Rights they established justice provided by citizen jurists as a cornerstone of American Democracy. Thanks to the 7th Amendment civil jury trials are a fundamental right and a prominent element of the American legacy. 3. Even today, natural people, corporations and insurers prefer to have a jury decide their cases that go to trial. Their faith in fellow citizens is abiding and inspiring. 4. The cause of the decline in civil jury trials has been exhaustively studied. For a variety of reasons it languishes as a neglected part of the infrastructure of our democracy. This demands swift action. 5. The Faster Civil Jury Trial, which ABOTA is advocating, will make civil trials briefer and more efficient. This strategy works both in complex cases and more routine matters. Very likely it is coming soon to a courtroom near you. 6. Restoration of proper funding of our courts is indispensable to maintaining access to justice through jury trials. A cardinal virtue of our democracy is open courts administered by a fair and impartial judiciary. In short, the rule of law. Together we need to alert our fellow citizens that their precious right to citizen justice is perilously close to slipping through their fingers.